Traveling during the snowstorm could be dangerous, authorities say. So don't go out unless you have to. 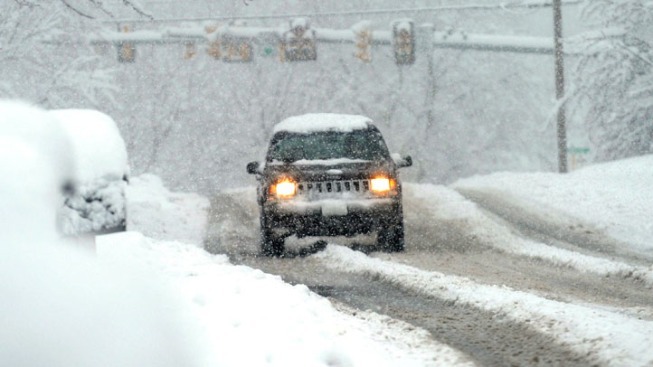 An SUV travels through the falling snow in Staunton, Virginia, Wednesday. Snow began falling early Wednesday morning with four to eight inches expected in the D.C. metro area. Wednesday's snowstorm has authorities and commuters bracing for a nasty evening rush hour, as roadways become slippery messes, buses and trains get canceled or rerouted, flights get scratched and the D.C. subway delays service to clear exposed tracks. In short, the message is this: Don't travel unless you have to, and if you do, leave early and go slow. The Chesapeake Bay Bridge in Maryland closed in the early afternoon on both directions due to high winds. D.C. Mayor Vincent Gray said city streets remained "passable" but he nonetheless urged people to stay off them. As temperatures drop, they could get icy. "That's why we closed the schools, why we closed the government, to keep people from having to travel," Gray said. For complete coverage of the storm, stay with NBCWashington. D.C. Department of Public Works Director William O. Howland Jr. said that with snow falling throughout the day, the evening rush could be dangerous. His agency began sending of plow trucks through the city late Tuesday. More than 200 will be working through the storm. He also urged residents to clear their sidewalks so that pedestrians don't get hurt. Conditions are expected to worsen on the area's roads as slush and wet snow continues to accumulate. Metrorail was operating on a regular schedule Wednesday, with no delays reported as of mid-morning. But officials advised that travelers leave extra time, because service may be delayed as crews clear tracks of ice and snow. Updates are available at the WMTA website. Some commuter Metrobus routes have already been canceled, with more possible throughout the day, WMTA said. Major city routes remained at or near normal service. The agency said it would try to provide two hours' notice of any new service disruptions. A good way to keep on top of such announcements is to subscribe to MetroAlerts. In Virginia, Wednesday VRE commuter rail service was canceled. The agency planned to run a normal schedule Thursday, but its final decision won't be made until 4 a.m.
Virginia's Department of Transportation deployed more than 4,000 salt trucks and plows throughout the northern part of the state. The department said drivers should check road conditions and traffic at its traffic information website or by calling 511. State police in Virginia reported 367 traffic accidents and 237 disabled vehicles through 10 a.m. Wednesday. Most involved damage to cars and there were few injuries. No one died in any of the storm-related crashes. Wednesday's slush could turn to ice overnight, making the early Thursday commute even more treacherous, officials warned. "Motorists need to use plenty of caution if out on the roads. Tomorrow morning commuters should monitor forecasts and check road conditions before heading out,” Branco Vlacich, VDOT’s maintenance engineer for northern Virginia, said in a statement. Amtrak service on Wednesday was operating with minor disruptions, which included the cancellations of trains from D.C. to Lynchburg, Va. and to Huntington, W.Va. Dozens of local flights have been canceled. Some airlines have relaxed itinerary change polices. Check your flight status before leaving the house Wednesday. In Maryland, the State Highway Administration has 2,300 crews plowing and treating roads. Officials urged drivers to stay back and give road crews enough room to do their jobs. Many cities, including Gaithersburg, Manassas, Leesburg and Frederick, declared snow emergencies and instructed residents not to park on snow emergency routes. Leesburg police told residents to stay off roads unless absolutely necessary.